As many families are preparing their children for a return to fall schedules and back-to-school routines, it’s a great time to start thinking about decluttering the kid zones in the house! 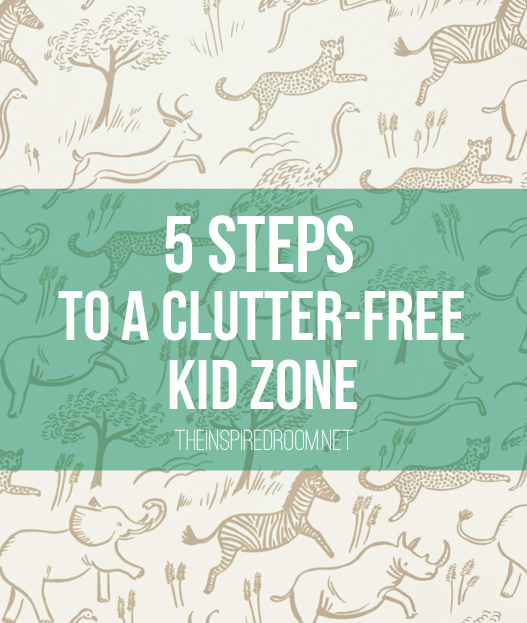 I’m over at The Decluttered Home today sharing my five steps to a clutter-free kid zone! Come on over! Functional & Beautiful: Sunbrella Fabric Indoors! Did you know you can use outdoor fabric on indoor furniture? I’ve recommended Sunbrella fabric for years to friends and clients but just recently was the first time I’ve ever been able to custom order it on a piece for myself! The beauty of the Sunbrella fabric is it’s very durable, easy to clean up, and resists fading. I think that’s the perfect combination for a family with kids and pets! You know how crazy Jack, Lily and Bella can be, so I’m sure you understand my need for durable fabric, haha!! We’ve been looking for a new chair for our family room for a couple of years. We bought an IKEA slipcovered chair awhile ago hoping it would work for us at least for awhile because the price was right and I loved that I could bring it home on the spot. I’m impatient like that and I was tired of looking for chairs. But a year later, we finally decided for a number of reasons it just really wasn’t what we needed or wanted for the space. The slipcover wasn’t as easy to clean as some that I’ve had, it attracted fuzz like crazy, and the style of chair was a bit wide and squatty for the space. Fortunately we were able to donate it to our church which was in need of furniture, so I was happy about that! It was cute! As I resumed looking around for what would be best for the corner of my family room, I decided to not settle this time. I was willing to wait for a more custom upholstery if I found something I wanted. 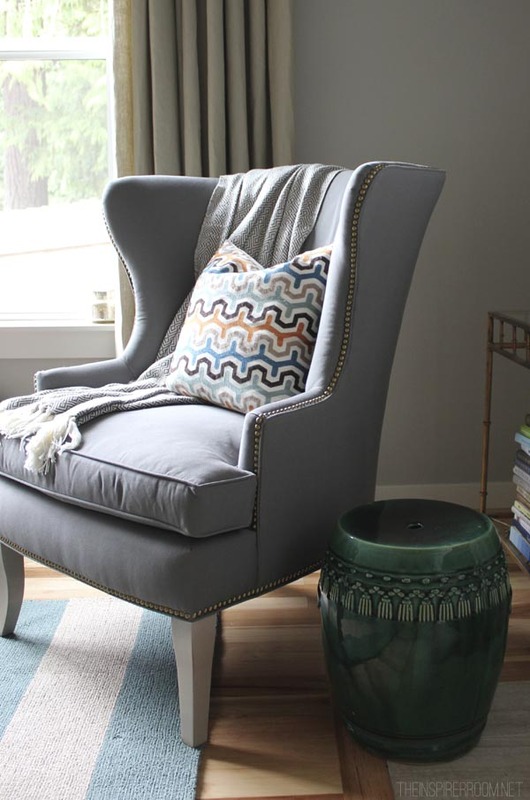 Since the chair was going to be in the family room and potentially a piece that we would want to move around the house, we definitely wanted very durable upholstery. Stylewise I had my heart set on a wing back because I felt like the room would be cozier and more balanced if the chair had a high back. Being mostly a use-what-you-have or can find second hand girl, I rarely have chosen furniture with many specific details in mind, so this was fun! 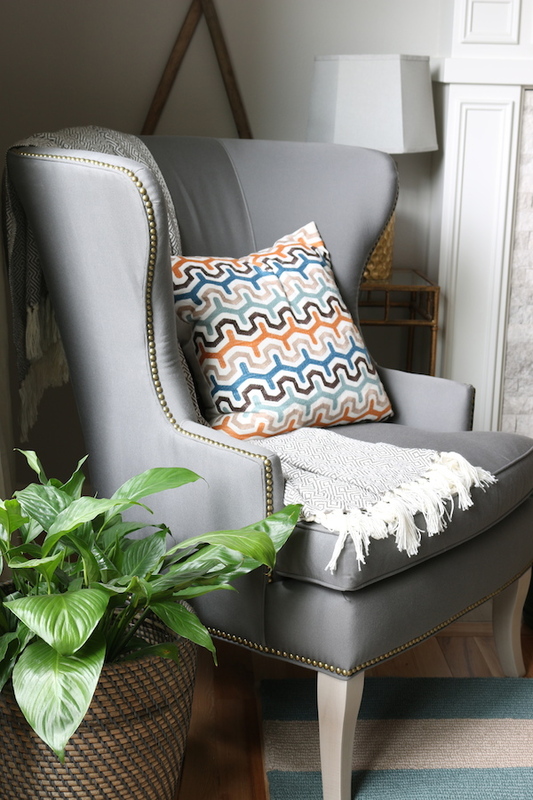 I hunted all over the place and I eventually found a wingback chair with pretty nailhead detail by Ballard Designs. The chair had such a lovely shape and I loved the graceful curves from every angle! I also loved that I could order it in Sunbrella fabric! So after hesitating about it forever, I decided to call and talk to Ballard Designs about it and place my order. They ended up graciously sending it as a gift in exchange for me sharing it with you! I wasn’t mad about that one bit. When it arrived (much sooner than I had expected! ), I was so excited to see it in the family room. It was just what I had hoped for and the fabric feels great! I went with “Canvas Gray Sunbrella” and Dove Grey legs. I love that I have no worries with kids or dogs around the chair and I am so pleased with how pretty it looks posing there next to my fireplace.